The first pressurized room used to treat health problems was built by an Englishman named Henshaw in 1662; however, it was not until over a century later in 1788, that compressed hyperbaric air was put to large scale use in a diving bell for underwater industrial repairs of an English bridge. The first deep sea diving suit, invented in 1819 by August Siebe, used compressed air supplied to the helmet for generous underwater movement. A French iron shop in 1834 built the first hyperbaric tank under the direction of Dr. Junod. 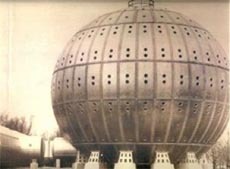 A copper sphere five feet in diameter with the appropriate viewports and compressed air fittings became the center of attraction for many patients. He reported wonderful recovery from a variety of debilitating conditions in the Bulletin of the Academy of Medicine. 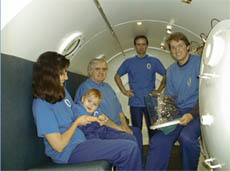 Hyperbaric enthusiasm spread among the European countries during the next forty years. Sick people came from America to try the new therapy. An enterprising Canadian built the first North American hyperbaric chamber in 1860. In 1918 Dr. Orval Cunningham considered the differences between people living or dying through the flu epidemic in the Rocky Mountains. He noticed people in the valley fared better than people in the mountains. He reasoned that denser air in the valley helped people fight the infection. He had an 8' diameter by 30' long hyperbaric chamber built next to his medical clinic. His good outcomes with patients suffering from pneumonia encouraged him to build other chambers. He built the world's largest functional hyperbaric chamber, a 64' steel sphere "hyperbaric medical hotel" with five floors of living space. The Great Depression in the 1930's ended his project and the giant chamber was scrapped for the war effort in the 1940's. Harvard Medical School had a hyperbaric chamber built in 1928. It provided a tool for years of research. Public interest for HBOT started to grow in the 1960's after publicity about its use on President Kennedy's sickly infant. In the last three decades great strides in Hyperbaric Oxygen research has raised the value of this unique therapy. University studies have expanded the list of conditions usefully treated with compressed oxygen. 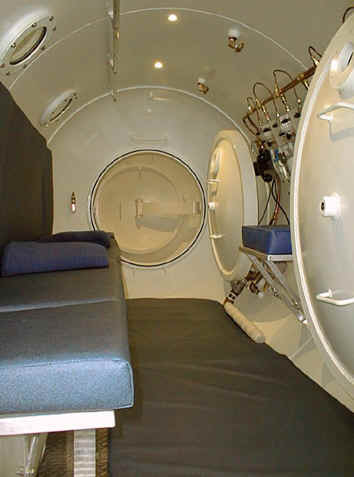 Our 6 person multi-place hyperbaric chamber can reach at 6ATA and it comes with a transfer lock. 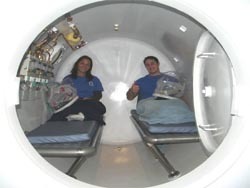 Our 4 person multi-place hyperbaric chamber can accommodate two people with stretches and it can reach at 4ATA. Want to learn more about hbot treatments? Click here.